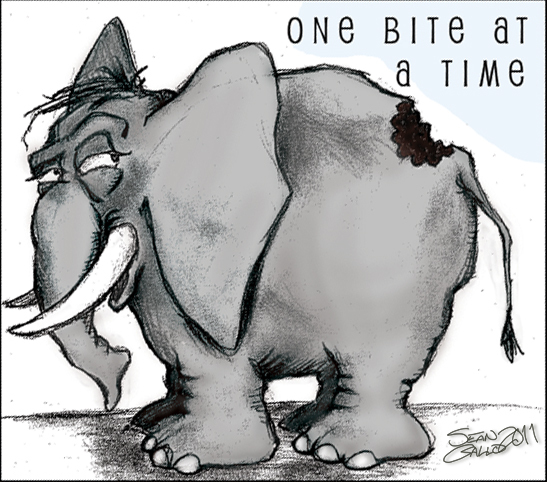 Do you know that saying that goes “How do you eat an elephant…? One bite at a time.” ? You may have heard this before… and if you haven’t heard it before, you can probably get the point… but just in case you don’t… this is a saying that people will use when they – or someone they know – is faced with a gigantic task to accomplish. .. when the job seems so big, that it’s almost impossible to imagine ever being able to complete it. And so the point is that – like attempting to eat an entire elephant – the best way to complete such a monumental effort, is to take it in small “bite-sized” pieces. Rather than looking at the whole – which could be overwhelming – you can look at one chunk at a time. A little while ago, my friend Kevin asked me to illustrate these words of wisdom for him, so that he could hang the picture by his computer, to give him perspective whenever a job started to feel too big to handle.